It was our turn to take time out of doing our client’s marketing and spend some time focusing on our own! This time, we opted for a highly targeted approach by sending the campaign to 13 selected businesses we want to work with as potential clients. So, to begin with we had to conduct our own research to find out who to pinpoint as the recipient at each of the businesses. The aim of the campaign was to highlight to potential clients they could be missing the “art of marketing”, but how? The idea is a simple three step approach over three weeks. The first step was to send the targeted recipients a box containing the letters “M-K-E-I-N-G” … this would surely generate curiosity amongst those who received the campaign – it is not the type of post you forget receiving! The next step was to wait a week before sending the second part of the campaign. 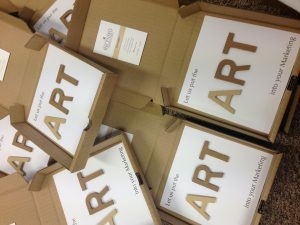 The second parcel they received was the missing letters from the previous parcel “A-R-T” with the caption “let us put the ART into your marketing” along with contact details of our managing director Ben Cooper. Finally, we needed to humanise the campaign and follow up the parcels with a phone call from Ben. The purpose of the phone call would be to introduce Recenseo and begin building a relationship with potential clients. Overall the campaign was a success generating some great results – with one recipient even hanging the campaign on the wall! From the campaign we arranged two meetings and created the opportunity to pitch to some very exciting potential clients. It goes to show a highly targeted campaign with quality leads and targets often brings more success than a mass produced campaign.